ESGO is the ultimate way to customize your experience to The Witcher 3. You can decide pretty much everything with over 200 options available. Change how much XP you get by quest or by killing monsters, change enemies health and damage, change the way enemies scale (or don't), and much more. Fixed bug when using the Auto Leveling Equipment option in a regular game (NG+ was not affected). Witcher and Relic gear levels would stop at 97, 98, or 99 and keep increasing stats everytime you equip them if they were below character level. Previously, ESGO calculated levels even if scaling was disabled. Now enemy levels are completely untouched if scaling is disabled. 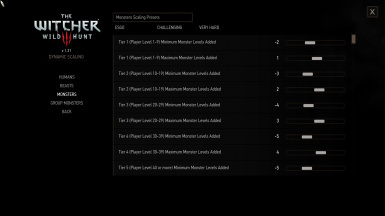 ESGO allows you to customize your Witcher 3 experience with over 200 options. It allows you to scale enemies in a way of your choosing. Scale differently according to level or type of enemy or choose not to scale them at all. Choose whether your equipment loses durability or requires a certain level to use. Choose how many skill points you get per level and how much experience you are awarded. Change how parrying and countering work. Customize how much health your enemies have and how much damage they do. All this plus many more options are available in the games Mod menu. You can change everything or leave everything at vanilla settings. To see all the options this mod gives you, check out the ESGO Options section below. You can visit ESGO's Website to find all the information below plus much more. The easiest way to install is to use the Witcher 3 Mod Manager. It will automatically install the mod and the mod menu for you. If you prefer to install manually, copy the “modESGO” folder to the “Mods” folder in your Witcher 3 installation directory. Then copy the “bin” folder from inside the “modESGO” folder and paste it into your Witcher 3 installation directory. If using Nexus Mod Manager or Vortex, you still need to copy the “bin” folder from inside the “modESGO” folder into your Witcher 3 installation directory. If you don't, you will not have a mod menu in game. If updating from a previous version, do the same as above. Choose overwrite when prompted. You also need to install the Unification Patch﻿. This mod was made from it. It helps mod authors so that we only have to release one version of our mods regardless of what game version (Steam, GOG, GOTY, non-GOTY) you have. If the script compiler runs when you start the game, you need to exit the game after reaching the main menu and restart. There is a bug in the vanilla game that can give you -1 potions, bombs, and oils if you load a save after the script compiler runs. This is a vanilla bug and it can happen anytime you add, remove, or update any mods. Currently ESGO is available in English and is mostly translated to German, Italian, and Russian. If you would like to translate the mod to another language, check the localization folder in the download. All the resources you need and the instructions for how to do it are located there. If using other mods, you need to use Script Merger to check for conflicts. Check out the ESGO Compatibility Page for more information. To uninstall, delete the “modESGO” folder from the “Mods” folder and delete “ESGO.xml” from the “The Witcher 3 Wild Hunt\bin\config\r4game\user_config_matrix\pc” folder. The Witcher 3 Enhanced Edition - The original creator of ESGO made this massive mod that overhauls pretty much everything. It is not compatible with ESGO, but most of the options here are also available there. Ghost Mode - This mod overhauls the entire game to make it much more challenging and balanced while sticking to the vanilla game's principles. Again, not compatible with ESGO, but it does have some options like level scaling and health/damage modifiers. 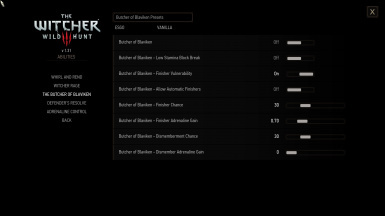 FriendlyHUD - One of the most popular mods for The Witcher 3. Enough said. Preparations Mod - From the creator of FriendlyHUD and Ghost Mode, this mod overhauls the alchemy and meditation system to be more strategic. Primer - Another alchemy overhaul like Preparations except it aims to replicate the alchemy system from The Witcher 1. 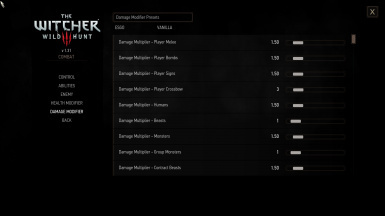 All Quest Objectives On Map - How can you play the Witcher 3 without this mod? Immersive Cam - Customize the camera to your liking with this mod. It also has some awesome optional features for how the player and horse controls work. Sort Everything - Improves the game's menus in more ways than just sorting. Endure - Gives you tons of options on how weapon/armor degradation works. It's way more in depth than ESGO and compatible. They merge together automatically. Just set durability damage in ESGO to vanilla and Endure will fully control item durability. 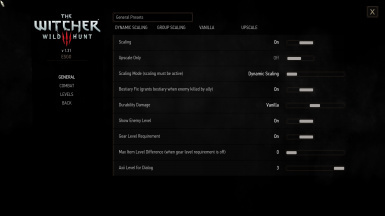 A must have mod if you really want more control on weapon/armor durability than what ESGO offers. Kukassin - The original creator of this mod. nolenthar - Reuploaded and maintained this mod after Kukassin moved on. Lukex33 - Updated the mod for game version 1.22.